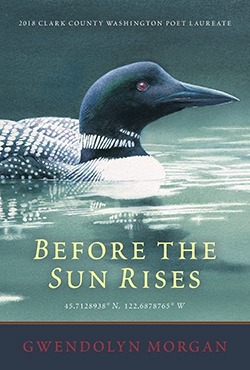 Gwendolyn Morgan learned the names of birds and wildflowers and inherited paintbrushes and boxes from her grandmothers. With an M.F.A. in Creative Writing from Goddard College, and an M.Div. from San Francisco Theological Seminary and the Graduate Theological Union, she has been a recipient of artist and writing residencies at Artsmith, Caldera, Into the Depths of Winter, and Soapstone. 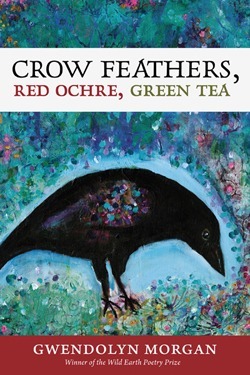 Crow Feathers, Red Ochre, Green Tea, her first book of poems, was a winner of the Wild Earth Poetry Prize, Hiraeth Press. 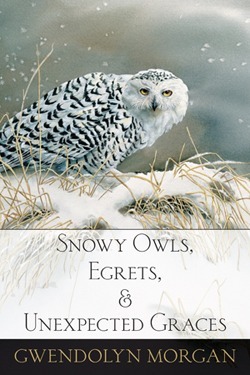 Snowy Owls, Egrets and Unexpected Graces (initially published by Hiraeth Press and currently published by Homebound Publications) is a Nautilus Gold Winner in Poetry and a Foreword Review Indies Book of the Year Finalist in the Nature Category. 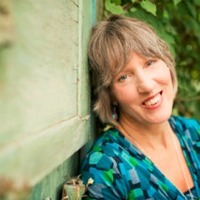 Her poems have appeared in: Calyx, Kalliope, Mudfish, Tributaries: A Journal of Nature Writing, Wayfarer, Written River as well as The Cancer Poetry Project 2, and other anthologies, blogs and literary journals. She is the Clark County Poet Laureate 2018-2020 in Washington State. Gwendolyn and Judy A. Rose, her spouse, share their home, music and creekside walks with Naomi, a rescued Cardigan Corgi & Chesapeake Retriever mix.